Our volunteer community was very busy last month! On November 19th we debuted our first #PlayMunchkin national event, the Holiday #PlayMunchkin Event, with MIBs celebrating Munchkin in its various forms at local game stores across the country. Then, over the Thanksgiving weekend, they helped our friends at USAopoly show off the latest expansions to Munchkin: Marvel Edition! Munchkin Marvel 2 – Mystic Mayhem and Munchkin Marvel 3 – Cosmic Chaos were instant hits! 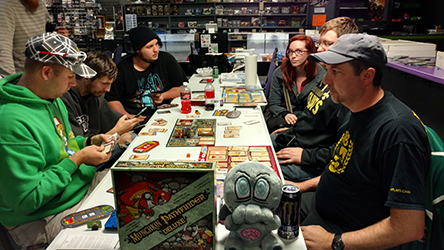 "On Saturday, November 19, 2016, MIB Steve Huckabee and his trusted partner, Zombie Chibithulhu, responded to reports of #PlayMunchkin at Dark Knights Gaming in Long Beach, Mississippi. 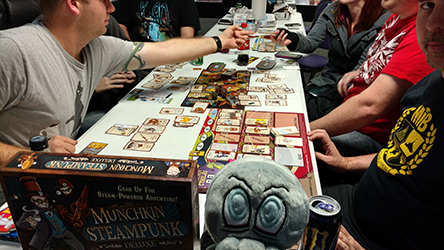 As we arrived we quickly realized that the reports were indeed true; there was much Munchkin to be played! We broke out our trusty tub of Munchkin games and asked the players which game they wanted to play. We had a great variety of Munchkin games available: Zombies, Marvel, Gloom, Axe Cop, Apocalypse, Bites!, Loot Letter, Steampunk, The Nightmare Before Christmas, Christmas Lite, Smash Up, Panic, Quest . . . but it was Munchkin Pathfinder Deluxe that was chosen for the first game. We wasted no time setting up the game and playing with a full table of six players. Each player was equipped with a brand new Munchkin Bookmark – and the battle began. In the end, Zombie Chibithulhu and I emerged as the victors. We picked up the game and the players once again went to the tub of Munchkin, this time choosing Munchkin Steampunk Deluxe. We quickly set up the game and began round two of our battle. In the end, it was the store owner, Gordon, who claimed the championship with his rather elaborate cane weapon. We had plenty of promos, bookmarks, Munchkin Playmats, Kill-O-Meters, and Dice Bags to share during the games and everyone had a blast! Zombie Chibithulhu and I packed up our Munchkin goodies, thanked the players for playing and the store for hosting, and headed back to headquarters to file our report of the night's activities." Thanks to Steve for his update! If you're an SJ Games fan and want to volunteer, check out our MIB program! If you're a retailer, recruit your local players to be a MIB for your store, and make sure you sign up for our Store Finder! You'll get information on all our upcoming events, as well as details about sign-ups for free event kits like the Holiday #PlayMunchkin Event kit.